Private investigator Jack Pellum has spent two years searching for the man he believes murdered his wife -- a man he last saw wearing a peacoat and a fedora. Months of posting fliers and combing through crime records yield no leads. Then a local writer commits suicide, and he leaves a bewildering message that may be the first breadcrumb in a winding trail of unsolved murders . . .
​Michael Underhill is a philosophical man preoccupied by what-ifs and could-have-beens, but his life is finally coming together. He has a sweet and beautiful girlfriend, and together they’re building their future home. Nothing will go wrong, not if Underhill has anything to say about it. The problem is, Underhill has a past that's shrouded in darkness, and it’s coming back to haunt him. ​These two men are inexorably drawn together in a mystery where there is far more than meets the eye, and nothing can be taken for granted. Filled with devious reversals and razor-sharp tension, The Man in the Crooked Hat is a masterwork from “one of America’s best new crime writers” (Lansing State Journal). "Set in Detroit, this relentless thriller from Dolan (The Last Dead Girl) focuses on an ex-cop’s search for the man who murdered his wife. Two years after Jack Pellum’s beloved Olivia, a photographer, was strangled near the Huron River, Jack remains obsessed with finding the killer, whom he believes to be a man wearing a fedora he saw watching her a few days before her death. He continues to blanket the city with flyers bearing the suspect’s image. Then Carl Dumisani, his former partner, reports that someone has written, “There’s a killer, and he wears a crooked hat,” on the wall near the body of a recent suicide. This news leads Jack to Paul Rook, who thinks that his mother was killed by Olivia’s murderer. Dolan has a gift for making the circumstances of even minor characters moving, such as a 30-something man resigned to a meaningless life working in a coffee shop. Superior prose, plotting, and characterization put Dolan in the top rank of crime novelists." "Jack Pellum carries that load nearly two years after his wife, Olivia, was found strangled near the Huron River in Detroit. Obsessed with finding the murderer, Jack lost his job as a police detective and has eschewed just about every chance his father, a prominent judge, offers to get his life back on track, including the private detective license his dad secretly arranged for him. "Jack is fixated on what-ifs. What if he had accompanied his photographer-wife that day when she went to take photos in the park? What if he had done something when he saw a man wearing a fedora a few days before Olivia was murdered? Meanwhile, Jack spends his days putting up fliers with the man’s likeness, most of which are soon ripped down. "The man in the hat is Michael Underhill, whose identity is revealed in the first chapter. Michael also is consumed by what-ifs, though his past is much darker — and more violent — than Jack’s. "Jack’s investigation jumpstarts when he learns that an author painted on his living room wall “There’s a killer, and he wears a crooked hat” before committing suicide. "Dolan skillfully sends Jack’s investigation on a circuitous route that includes the murders of others that may — or may not — have been committed by Michael. Along the way, Jack teams up with Paul Rook, a young man convinced that his mother also was murdered by the man in the hat. For Jack and Paul, Michael becomes a quasi- bogeyman, always 'on the edge of things,' and they sometimes wonder if he is a phantom. But Michael thinks he’s just an ordinary guy who has just met a wonderful woman he believes he may marry. "Jack does his best with the only lead he has, plastering the city with a sketch of a hatted man he saw acting suspiciously near his apartment before his wife’s death: 'Have you seen him?' Someone has — a fellow obsessive who thinks that the man in the crooked hat is linked to another murder and to several other past killings. Jack and his semi-partner expand their inquiries into neighboring towns and decades-old crimes, drawing other police officers, active and retired, into their investigations. "Ex-cop Jack Pellum is obsessed with finding his wife’s killer. He posts fliers daily and checks all homicides in the city for similarities. His fixation on the killer’s hat seems insane, especially since he’s seeing a psychiatrist. But then he learns of a suicide where the note mentioned a killer in a crooked hat, and this is the key that eventually pulls his farfetched theories solidly into the realm of reality. "We also follow the killer as he falls in love and tries to tie up loose ends (including Pellum) so he can settle down and transform into a good guy. 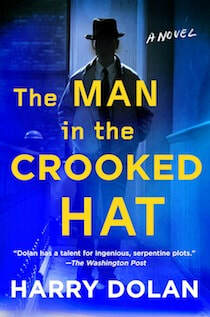 "The title of Harry Dolan’s The Man in the Crooked Hat (Putnam, out Nov. 28) speaks volumes. Set mostly in Detroit, this is an unpredictable mystery with an off-kilter plot and distinctive characters. Jack Pellum is a Michigan PI on a mission to find the man in the crooked hat who he believes murdered his wife. Jack’s investigation uncovers connections to two other murders 20 years earlier where a witness also saw a man in a hat. But is he the same person? Related? Or has Jack’s obsession taken on a life of its own? With deft dialogue propelling its plot, you’ll need to, well, hold on to yours." "The Man in the Crooked Hat [is] a multi-layered, suspenseful mystery-thriller with nuanced characters guaranteed to propel the plot and hold any reader's interest." "Harry Dolan can be counted on to craft seamless thrillers, and his latest, The Man in the Crooked Hat, featuring dogged detective Jack Pellum, does nothing to break his streak." "A tortured ex-cop searches for vengeance in this stand-alone novel from Dolan, read by Richards. Jack Pellum was a devoted husband to Olivia, a talented photographer who was murdered in a riverside park in Detroit. After Olivia’s death, Jack quit his job and devoted himself to finding her killer, his only clue the man in a fedora Jack saw shortly before the murder. The whodunit might be a mystery to Jack, but it’s not to listeners, who meet the killer early on and catch a glimpse into his mind. Richards’ understated reading works well in a mystery that focuses on the why of the case instead of the who. Although some of his characters sometimes sound a bit too much like others, overall, this is a solid performance that suits the book. A fascinating look into the mind of a killer and the ripple effects of a murder." "Delightfully deceptive.... Dolan is a masterful plotter and this story is brilliantly conceived.... Harry Dolan never disappoints."